… The first impression counts. Make the most of it! The first impression counts, so you should make most of it, especially in the case of presentation. Therefore, the more you are able to excite and attract the audience, the higher your chances of success. However, regardless of how good you are in making presentations, if you lack the proper tools to make the desired impression, the final effect may not be achieved. It matters both in business and in education. 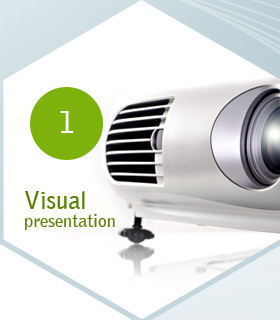 Our modern presentation aids ensure ease of use, flexibility and efficiency. Starting from numerous universal projectors and screens, all the way to a wide range of pointers, tables and other presentation accessories. We ensure the ideal base for creating and giving inspiring presentations.